Yoga Nidra is also called “yogic sleep”. It is a deep relaxation technique. One hour of Yoga Nidra is equivalent to four hours of deep sleep. Students are guided through a multi-step process that includes different relaxation techniques, awareness of the body and breath, energy balancing, and a guided imagery. Yoga Nidra relaxes and balances the person on all levels of their being. Yoga Nidra is appropriate for anyone who wishes to increase body awareness and relaxation. NO YOGA EXPERIENCE REQUIRED!! 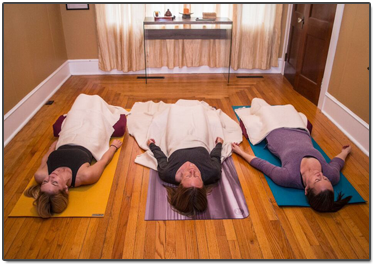 Yoga Nidra classes are offered twice monthly on Sundays. Exact times vary. Email chapgood01@nf.sympatico.ca for offerings or to register. Yoga Nidras are held at Yoga Kula Coop, Coakers Meadow Plaza (286 Torbay Road). Yoga Nidra is one hour in duration. Yoga Nidra is a guided meditation that induces deep relaxation of the body and mind with the ultimate aim of increasing self-awareness. It is a powerful relaxation and meditation technique derived from ancient tantra and developed by Swami Satyananda of the Bihar School of Yoga. Yoga Nidra enables you to remain aware while you enter into the dream and sleeping states of consciousness. The state of Yoga Nidra occurs when you can remain conscious during the deep sleep state while being led on a meditative journey. The practice of Yoga Nidra is accessible to anyone; it helps create deep relaxation, and can be beneficial in your mental and physical well-being.